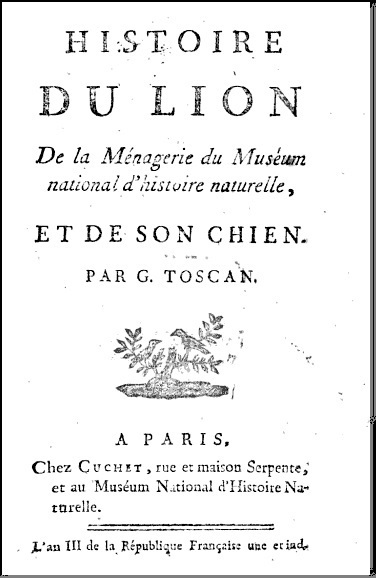 A Lion, about three months old, was, in 1787, caught in one of the forests of Senegal; and Pelletau, the director of the African company in that colony, undertook to superintend the animal's education. The mildness of his physiognomy, and the unusual gentleness of his disposition, rendered this Lion a great favourite with all persons who saw him. Sensible of the good treatment that he received, he seemed, on all occasions, highly delighted with the caresses and attention of his friends, atid was, in most respects, as tractable as any domestic animal could be. Such was his love of society, that he was always delighted to be in a room where many persons were assembled: and what was very extraordinary, he lived in perfect harmony, and was at all times on the best terms, with the other animals, of every species, that were kept in his master's house. He slept in the same place with sheep, dogs, cats, monkeys, geese, ducks, &c. When he was about eight months old, two whelps were littered by a Terrier on his bed. This new family excited a most lively interest in the Lion; and if he had been the parent of the little animals, he could not have displayed to them an attachment more tender than that which was now remarked in him. One of the whelps died; his affection was redoubled towards the other; and this affection appeared to regulate all his movements. At the age of fourteen months, the Lion, with his little companion, was embarked for France. It was feared that the change of situation and habits would have had such influence as to render him in some degree ferocious. This, however, was not the case; for he could at all times be allowed, without danger, to range at liberty in the vessel. He was landed at Havre, and, attended by his faithful dog, was, with only a cord attached to his collar, conducted thence to Versailles. On the death of the dog, which took place some little time after their arrival at Versailles, he seemed to be very disconsolate and miserable; and it was thought necessary to supply the loss of his companion by putting into his den another animal of the same species. The second dog, terrified at the sight of so tremendous a beast, immediately endeavoured to conceal himself; and the Lion, surprised by the noise, struck the animal with one of his fore-paws, and killed it on the spot. He did not, however, attempt to devour it. A third dog was put into his den, and lived with him for some years afterwards. 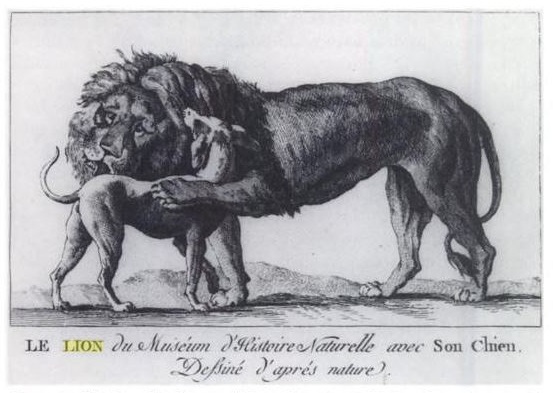 The lion was one of the few animals to survive the depredations of the Revolutionary years and the transfer of the Menagerie to the Jardin des plantes. His canine companion accompanied him but, to the lion's distress, died soon afterwards. Woira himself probably perished in the frosty winter of 1795. E. C. Spary, Utopia's Garden: French Natural History from Old Regime to Revolution (Univ.of Chicago Press, 2010) p.148.